My name is first in the list...but ONLY if it's a Steelbook (which it doesn't state just yet)! What else could it be? Have they done non-steels before? 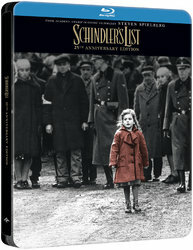 I am most excited for Schindler's list!! One of my favourite films on 4K is a dream come true. I'll most likely get the others too. Twitter reply regarding list of titles announced. I damn well hope so after seeing such a lazy WWA . This is Steven Spielberg's most personal triumph. I just don't think he's going to allow a lot of artistic freedom for this. It's not the kind of movie to explore artistic interpretations. It's just too personal. It'll be interesting to see how their slip quality improves with these new packs. Slip repeating the steelbook art is a shame. Also too much focus on art cards, i think mostly customers pay attention to slips and booklet, cards are usually the least concern. This mounting thing is an interesting idea, i hope it will turn out good. So, it seems it’s a direct competitor with future CMA release, with a dressed up WEA steel. CMA already proved themselves with super high quality slips, but the price is usually more expensive. Honestly, don’t know. I will have to chose one of the releases, and i suspect i will choose CMA. Also preorder 3 months prior to release is a little too much. Repeating the same cover art as the Steelbook is a big negative for me, don't think I'll be going for this one. As requested by Steven Spielberg himself apparently. Think I'll just stick to bare bones zavvi release managed to get it with 15% off voucher so this is nearly double price for a slip with same artwork. No a fan of tittle less steels but will take it for now unless manta announce one with WEA but not holding my breath. Which is how you can tell those who just take chances and risks. code for, he cant be bothered and thats what he allowed/approved. And before anyone thinks im dogging this edition on this thread that is not the case. Think it looks great given the limitations.